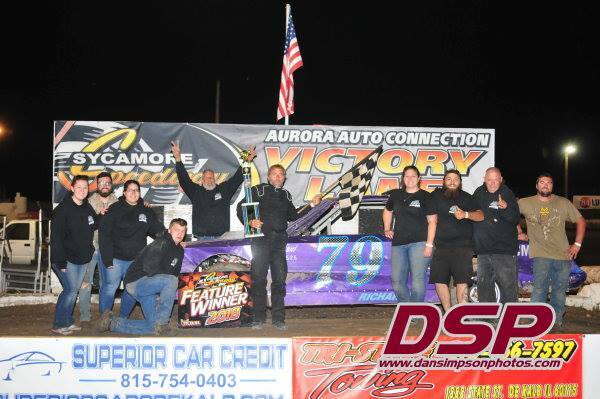 2019 Street Stock – Sycamore Speedway : Midwest's Best Clay Track! 1. Cars may be painted as you choose, but number must be a bright, contrasting color. WHEELS MUST BE SOLID WHITE OR CHROME or FLOURESCENT COLORED for easy visibility in the event one is thrown. Day-Glo paint is strongly recommended. NO PRIMERED CARS. NO TWO CARS PAINTED IDENTICAL WITHIN THE SAME CLASSES! 2. 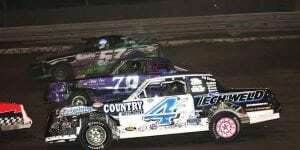 We require all drivers, for Dirt Late Model (fka 4-Bar), SLM, Street Stock (fka. Late Model), and Pure Stock & any visiting class to wear a flame resistant driving suit, a two piece suit is ok. Closed toed shoes & gloves. A Snell approved helmet with face shield, no Motocross helmets allowed. For Spectator, Powder Puff, Socker Stocker & Compact Combat at minimum, long sleeves, long pants, gloves and closed toed shoes and a Snell approved helmet with face shield are REQUIRED. 1. Dirt Late Models (f.k.a. 4-Bar), Super Late Models, Street Stock (f.k.a. Late Models), and Pure Stock all must be equipped with welded cage types. ROLL CAGES WELDED TO THE FRAME OF THE CAR. Bars must pass inspection of the tech steward. Suggested specs for roll bars are: wall thickness; .095. Outside diameter; 1-1/2”. No pipe joints; bars must be welded and angle joints reinforced. No galvanized pipe. DOM type tubing is recommended. 2. All Dirt Late Models (a.k.a. 4-bar), Super Late Model, Street Stock (a.k.a. Late Model) and Pure Stocks cars must be equipped with a 5 point racing harness. MANDATORY. Certification must be visible and show 3 yrs or newer. They need to be securely fastened to the frame of the car. Belts must have quick release metal buckle. Shoulder harness is mandatory. Shoulder harness must be quick release type. I. For All Classes running at Sycamore Speedway, all drivers must use a race receiver. Fusion 1600 is a very common type and is most common at a lot of other facilities too. Our Channel is 454.000. PLEASE NOTE: you cannot use a transmittable radio, it must be a 1-way receiver only. The general rules for the Sycamore Speedway apply to the Street Stock Class. Please read above. 1. Open to any American 8-cylinder car with a stock wheelbase no less than 107 inches. 1. Car must weigh a minimum of 3300lbs. with driver after the race. 1. Body must be in original position on frame and cannot be altered and must sit level with frame. STEEL BODIES ONLY. Example: Stock Style Five Star Steel bodies. Stock style appearing fiberglass roof and hood permissible. 2. Front bracing must be behind factory nosepiece mandatory. 3. MANDATORY Cable or chain exposed at front & rear of car for towing purposes. 4. All bracing and reinforcing must be inside car. NO solid material used for bracing. All bracing above original floor. 6. Any cutting of the hood for vents or radiators must be covered with sheet metal and painted same color as car. 7. Hoods—Air scoops permissible (4” maximum height). 8. Filler disk in steering wheel recommended (i.e. AFCO). 9. Rear Spoilers allowed with a 6” max height. Measured off of deck lid. 10. All trunk lids must taper down towards the rear in stock fashion. No raised flat deck lids. Deck lids must pitch towards rear bumper. 1. Screens are mandatory for windshield and must be mounted from A-Pillar to A-Pillar. No Screen=No Race! 1. All engines must be stock appearing and in stock position. Rigid mounts are allowed. Engine in stock location only. NO aluminum heads. Right front spark plug must be straight in line with right front upper ball joint; no tolerance. NO aluminum engines. Stock appearing, steel firewall is required but may be modified for engine clearance. 2. Cylinder heads – any cast iron 23 degree allowed. 3. Stock cast iron 2 barrel intake manifold OR Edelbrock 2901/2912 Victor JR.
4. Oil cooler permissible and oil pans with increased capacities permissible. 5. ENGINES & TRANSMISSIONS: May be interchanged with other makes such as a Chevy motor and trans in a Ford, etc. Engine must be mounted in original mounts or if altered, front spark plug must be in line with right front ball joint. Engine must be stock appearing. 1. Carburetion is limited to 1 two-barrel Rochester carburetor with maximum venture opening is 1.250” or unmodified Holley 4412 500 cfm. Holley carbs will be check with BLP 7860 gauge kit. 2. CARBURETORS: must be stock mounted. NO drilling of carburetor or manifold. No altering to mount. Adapter may be used. 4. Carb must be stock and unmodified. Note: Choke may be removed but not choke horn. 1. STOCK STEEL STICK SHIFT FLYWHEEL ONLY. NO ALUMINUM OR ANY OTHER TYPE. 2. Relocation of shifting mechanism is permissible. Any stock OEM transmission allowed. No five-speed transmission allowed. No in and out boxes. Stock type clutches only. 3. If running automatic transmission must have liquid filled torque converter. 4. Must have inspection cover for clutch and/or torque converter. 5. Must have a scatter shield. 6. No racing transmissions. Automatic or manual OEM 3 or 4 speed only. 7. Rear axle-only one set up; either leaf or coil spring. 1. NO repositioning allowed of A-frame. Right front wheel may run increased camber. The above will be measured from stock ORIGINAL POSITION. If using a non-factory upper control arm mount, a 100LB weight penalty will be imposed. Weight must be mounted ahead of the bell housing and must be removable to verify weight at any time during the season. 2. Spindles; STOCK TYPE ONLY, NO heavy duty. 3. All springs must be uniform and sit level with the ground. Cars must sit level (reasonable). Five inch minimum frame clearance from center of front cross member to ground. No sway bars on rear. Stock appearing suspension only. Stock diameter on front sway bar. 4. REAR SPRING – 4 maximum. 58 inches maximum length. BOTH SIDES-SAME SPRINGS. STOCK TYPE ONLY. No use of extra-long leaf spring. Must be of stock length. Mounted in stock position. 6. SHOCKS: Steel bodied non-adjustable racing shocks permissible. 7. Leaf Spring—may have adjustable front mounts. 1. Stock type rear end or Ford 9” permitted. 2. Must be stock style O.E.M. brackets. All brackets must be in O.E.M. mounting position. Floater permissible. 3. All rear ends must be locked. J. BRAKES – Dual masters are permissible with brake bias. Must run O.E.M brake calipers. 1. Roll bars must be installed. NO welding on threads or threaded joints allowed. All cars must have driver’s door protection. No galvanized pipe. 2. All cars must have stock appearing steel floor pan installed in original position. Camaros may connect sub-frames. 1. Standard steering only. No steering assist or quickeners. Power steering recommended. 2. Must be installed in trunk and equipped with a steel firewall between driver and tank. 3. Fuel lines running inside the car must have rubber coating. 4. Fuel pumps mechanical only. No electrical fuel pumps. 5. GASOLINE ONLY. Racing gasoline allowed. 6. Twenty Five (25) gallons maximum. 1. Headers permissible. Exhaust pipes must extend to the rear or left side only. Diameter of rear exhaust pipes can be no larger than exhaust pipe from manifold. No more than two exhaust pipes allowed on any car. NO 180-degree headers allowed. 1. All radiators must fit under the hood. No antifreeze. 1. Wheels 15” steel only. Max. rim width 8”. One-inch pipe permitted over valve stem. No spacers unless approved by tech. 3. Racing wheel optional. All wheels must be painted WHITE or FLOURESCENT or CHROME Colored. 4. Steel wheels only allowed. Bead locks allowed on right rear only. 1. No high performance products of any type. No nerf bars, no traction control, lengthened spindles, heavy shocks, aluminum head and manifold, and MSD boxes, etc. A. Eligibility – Must compete in 90% of races at Sycamore Speedway. No point money if you race at another track on a night that Sycamore Speedway is racing. $1500 will be used for a final point fund. All payouts & point fund payments are paid to car owner. C.	If a Street Stock (fka Late Model) Driver is champion for two consecutive years, s/he must move up to the Super Late Model Class or take a season off. D.	MUST meet point fund qualifications to be eligible for any points money. All final point money paid at end of season.